The satoshi is currently the smallest unit of the bitcoin currency recorded on the block chain. It is a one hundred millionth of a single bitcoin (0.00000001 BTC). The unit has been named in collective homage to the original creator of Bitcoin, Satoshi Nakamoto. All amounts in the block chain are denominated in satoshi before being converted for display. The source code also uses satoshi when specifying an amount of bitcoin. When displaying an extremely fine fraction of a bitcoin, such as when calculating fee per byte or a faucet reward, the amount is displayed in satoshi for readability. Although the satoshi is the finest amount that can be recorded in the block chain, payment channels may need to make very granular payments and so are sometimes denominated in millisatoshi, which are one hundred billionths of a single bitcoin. In January 2018, 1 Euro cent is worth approximately 83 satoshi. In December 2017, BIP-176 also proposed "Bits" be used as a standard term for 100 (one hundred) satoshis or 1/1,000,000 (one one-millionth) of a bitcoin. Traditionally, the plural form has been simply satoshi, but the term satoshis is also popular and equally correct. If the plural form were to follow the rules of Japanese grammar, it may be pronounced as satoshisa, or simply satoshi. 里 In Japanese names, this character can (rarely) be read "satoshi". It is an uncommon Chinese/Japanese character on its own, and an infrequent radical (kangxi #166). It can be seen as a radical in the common kanji 理 and 量, used in meaningful words like: 理想 (ideals), 理論 (theory), 理性 (reason), 理科 (science), and 量 (quantity). "Satoshi" is a rare reading; more commonly it is read as "ri" or "sato". シ A Japanese katakana representing the syllable "shi". Note that this character is extremely common in Japanese, so it could cause confusion. Also, it can mean "death" in Japanese and Chinese. ㋛ As above, but circled to distinguish it from the katakana. し As above, but this is the hiragana instead of the katakana. This is even more common than シ in Japanese writing, however. サ A Japanese katakana representing the syllable "sa". Maybe it looks more reminiscent of a currency symbol than others. Note that this character is extremely common in Japanese, so it could cause confusion. ↑ 2.0 2.1 BitcoinTalk thread 407442. How did “satoshi” become the name of the base unit? 9 January 2014. Post 4415850. ↑ 3.0 3.1 BitcoinTalk thread 819656. Why 1BTC should equal 10^8 satoshi ? 11 October 2014. ↑ 4.0 4.1 BitcoinTalk thread 382374. Bitcoin source from November 2008. 23 December 2013. ↑ Binns, Will. "How do I calculate my transaction fee?". 21 Support. https://support.21.co/bitcoin/transactions-and-fees/how-do-i-calculate-my-transaction-fee. Retrieved 23 October 2017. ↑ Barnes, Samuel (9 April 2014). "Do These "Free Bitcoin" Sites Work?". CryptoCoinsNews. https://www.cryptocoinsnews.com/do-free-bitcoin-sites-work/. Retrieved 19 August 2015. ↑ BitcoinTalk thread 369. Official Bitcoin Unicode Character? 14 July 2010. Post 22160. ↑ BitcoinTalk thread 3311. More divisibility required - move the decimal point 10 February 2011. Post 46648. 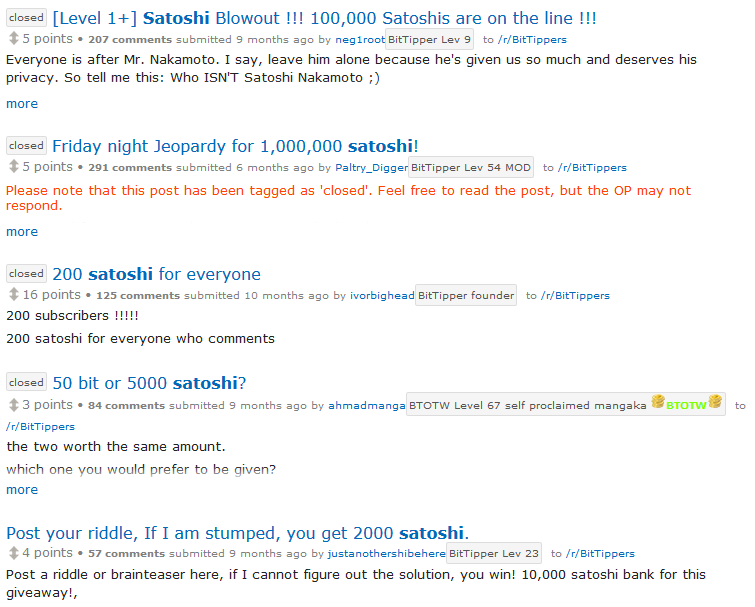 ↑ 12.0 12.1 BitcoinTalk thread 289475. satoshii 9 September 2013. Post 3112861. This page was last edited on 15 February 2018, at 15:40.